Published: Dec. 31, 2012 at 02:47 p.m. Updated: Dec. 31, 2012 at 07:17 p.m. It is #blackmonday everybody (yes, we're only allowed to speaking in #s going forward), a time when coaches lose their jobs. Well, sorta. If you look at the NFL as one giant corporation, then these coaches have merely been reassigned within the organization. Hey Gailey, guess what? You're no longer in charge of our entire Buffalo operation. But don't fret; you're going to be relocated to Miami, where you will be a consultant to the quarterbacks. You know, not much different than the manager of the Philadelphia Flying J being relocated to the outpost in Cleveland. Some fan bases, of course, will rejoice at the news of an embattled coach being let go (right Philly?) or others will complain when their coach is retained (hello, Dallas! ); remember a removal isn't alwys the best thing. 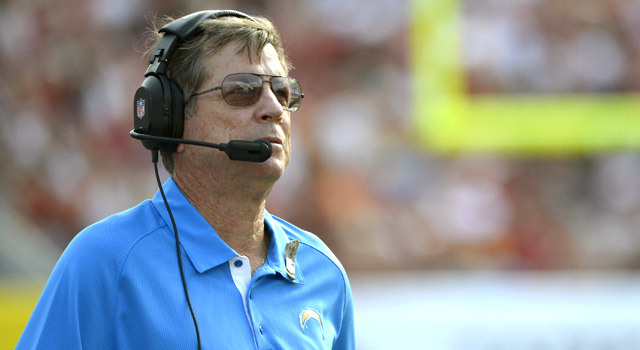 San Diego Chargers: Norv Turner went 56-40 with three postseason appearances after Marty (A.M.). Cleveland Browns: 121-214-1 with just four winning seasons since 1988. Kansas City Chiefs: 98-126 with just five winning seasons and three postseason since 1998. So be careful what you wish for, respective fans bases (looking at you, Arizona). And in honor of #blackmonday, here are six coaches who should have never lost their gig. We will exclude Marty because he would occupy four spots, and we will include coaches who had their contracts run out. Honorable mention: Chuck Knox (Los Angeles Rams); Mike Shanahan (Denver Broncos); Jeff Fisher (Titans) and Tom Coughlin (Jaguars). Ron Rivera might not last the week as Panthers coach, and the man he replaced in Carolina is now in Denver, and has led the Broncos to back-to-back playoff appearances. Yes, Fox has Peyton Manning this year. Fox reached the playoffs and won a game with Tim Tebow last year. TIM TEBOW. The Bears had the best defense of the 1980s (sorry Giants), but many will point to Ditka's playoff failures which led to his ultimate demise. But please consider Ditka went with Steve Fuller and Doug Flutie against Joe Montana and Phil Simms. Bears fans should feel lucky Dieter Brock was the quarterback of the Los Angeles Rams in 1985. So cut Ditka a break. Except for the Walter Payton touchdown thing. There is no excuse for that. When the Browns moved to Baltimore, Belichick was replaced with Ted Marchibroda. Seriously. The Ravens did eventually win a Super Bowl with Brian Billick. But image what the Ravens might have done in the sixth-round of the 2000 NFL Draft if Belichick was still with the team. Yes, this was technically a trade. But this is my list, so I will count it. And maybe the Raiders would have won Super Bowl XXXVII if they faced the Eagles and not Gruden's Buccaneers. But do you know how that could have been 100 percent avoidable? Exactly. Wait, you get what I was going for there, right? I meant if they had never traded Gruden and instead kept him on the team. I just wanted to be sure we were on the same page. Jerry Jones boasted there were 500 coaches who could have led the team to multiple Super Bowl titles. And then he got rid of Johnson and hired coach No. 501, Barry Switzer. The Cowboys did get a Super Bowl with Switzer. But it's no exaggeration (and maybe I spend too much time with Michael Irvin) to think the Cowboys could have won four consecutive titles. You have to give the Cowboys at least a three-peat. Coaches and owners have collided as long as sports have existed. But when Art Modell fired Paul Brown in 1963, there was one thing that was different. The difference? Paul Brown FOUNDED THE TEAM! The Browns were NAMED. AFTER. BROWN! That would be akin to the Steelers firing U.S. Steel. The Packers firing ACME. Or the Browns firing Paul (freaking) Brown. Needless to say the Browns have never been to a Super Bowl, nor won a title and won one title since Brown left that year (though it was with a team he built in 1964). Seriously, the team was named after the guy. "Which rookie had the best season in 2012?..."